HONOR OF THE SACRED PASSION OF OUR LORD JESUS CHRIST. Ever glorious and blessed Mary, Queen of Virgins, Mother of Mercy, hope and comfort of dejected and desolate souls, through that sword of sorrow which pierced thy tender heart whilst thine only Son, Jesus Christ, our Lord, suffered death and ignominy on the Cross; through that filial tenderness and pure love He had for thee, grieving in thy grief, whilst from His Cross He recommended thee to the care and protection of His beloved disciple, St. John, take pity, I beseech thee, on my poverty and necessities; have compassion on my anxieties and cares; assist and comfort me in all my infirmities and miseries, of what kind soever. Thou art the Mother of Mercies, the sweet comforter and refuge of the needy and the orphan, of the desolate and the afflicted. Cast, therefore, an eye of pity on a miserable forlorn child of Eve, and hear my prayer; for since, in just punishment of my sins, I find myself encompassed by a multitude of evils, and oppressed with much anguish of spirit, whither can I fly for more secure shelter, O amiable Mother of my Lord and Saviour, Jesus Christ, than under the wings of thy maternal protection? Attend, therefore, I beseech thee, with an ear of pity and compassion, to my humble and earnest request. I ask it, through the bowels of mercy of thy dear Son; through that love and condenscension wherewith He embraced our nature, when, in compliance with the Divine will, thou gavest thy consent, and Whom, after the expiration of nine months, thou didst bring forth from the chaste enclosure of thy womb, to visit this world, and bless it with His presence. I ask it, through that anguish of mind wherewith thy beloved Son, our dear Saviour, was overwhelmed on Mount Olivet, when He besought His eternal Father to remove from Him, if possible, the bitter chalice of His future passion. I ask it, through the threefold repetition of His prayers in the garden, whence afterwards, with dolorous steps and mournful tears, thou didst accompany Him to the doleful theatre of His death and sufferings. I ask it, through the welts and bruises of His virginal Flesh, occasioned by the cords and whips wherewith He was bound and scourged when stripped of His seamless garment, for which His executioners afterwards cast lots. I ask it, through the scoffs and ignominies by which He was insulted; the false accusations and unjust sentence by which He was condemned to death, and which He bore with heavenly patience. I ask it, through His bitter tears and bloody sweat, His silence and resignation, His sadness and grief of heart. I ask it, through the blood which trickled from His royal and sacred head when struck with the sceptre of a reed, and pierced with His crown of thorns. I ask it, through the excruciating torments He suffered, when His hands and feet were fastened with gross nails to the tree of the Cross. I ask it, through His vehement thirst and bitter potion of vinegar and gall. I ask it, through His dereliction on the Cross, when He exclaimed: "My God! My God! why hast Thou forsaken Me?" I ask it, through His mercy extended to the good thief, and through His recommending His precious soul and spirit into the Hands of His eternal Father before He expired, saying: " All is consummated." I ask it through the blood mixed with water, which issued from His sacred Side when pierced with a lance, and whence a flood of grace and mercy has flowed to us. I ask it, through His immaculate life, bitter passion, and ignominious death on the Cross, at which Nature itself was thrown into convulsions by the bursting of rocks, rending of the veil of the temple, the earthquake, and darkness of the sun and moon. I ask it, through His descent into hell, where He comforted the saints of the old law with His presence, and led captivity captive. I ask it, through His glorious victory over death, when He arose again to life on the third day, and through the joy which His appearance, for forty days after, gave Thee, His blessed Mother, His Apostles, and the rest of His disciples; when in thine and in their presence, He miraculously ascended into Heaven. I ask it, through the grace of the Holy Ghost, infused into the hearts of His disciples, when He descended upon them in the form of fiery tongues, and by which they were inspired with zeal in the conversion of the world, when they went to preach the Gospel. I ask it, through the awful appearance of thy Son, at the last dreadful day, when He shall come to judge the living and the dead, and the world by fire. I ask it, through the compassion He bore thee in His life, and the unspeakable joy thou didst feel at thine assumption into Heaven, where thou art eternally absorbed in the sweet contemplation of His Divine perfections. 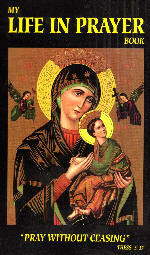 O glorious and ever blessed Virgin, comfort the heart of thy suppliant by obtaining for me. And as I am persuaded my Divine Saviour doth honor thee as His Mother, to whom He can refuse nothing, so let me speedily experience the efficacy of thy powerful intercession, according to the tenderness of thy maternal affection, and His filial loving Heart, Who mercifully granteth the requests, and complieth with the desires of those that love and fear him. Where�fore, O most Blessed Virgin, besides the object of my present petition, and whatever else I may stand in need of, obtain for me also of thy dear Son, our Lord and our God, a lively faith, firm hope, perfect charity, true contrition of heart, unfeigned tears of compunction, sincere confession, condign satisfaction, abstinence from sin, love of God and my neighbor, contempt of the world, patience to suffer affronts and ignominies, nay, even, if necessary, an opprobrious death itself, for love of thy Son, our Saviour, Jesus Christ. Obtain likewise for me, O sacred Mother of God, perseverance in good works, performance of good resolutions, mortification of self-will, a pious conversation through life, and at my last moments, strong and sincere repentance, accompanied by such a lively and attentive presence of mind as may enable me to receive the last Sacraments of the Church worthily, and die in thy friendship and favor. Lastly, obtain, I beseech thee, for the souls of my parents, brethren, relatives, and benefactors, both living and dead, life everlasting. Amen.